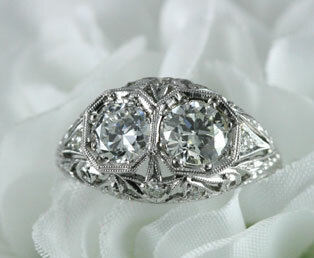 Two European diamonds represent the unity of the married couple in this estate platinum engagement ring. This 1930s engagement ring has octagonal mountings framing these double old European-cut diamonds (over 1 1/2 carat total weight). Symbolizing the couple, one diamond is slightly larger and darker than the other diamond. Like a starry night, brilliance is added by eight smaller diamonds scattered throughout this ring. This elegant, yet durable, platinum mounting showcases superb craftsmanship with superb open work cuts and fine millegrain accents. 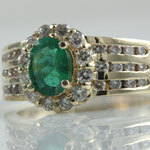 These old European diamonds radiate in all directions. Old European diamonds were the transitional cut between old mine cut diamonds and today's brilliant cut diamond. They are recognized by their rounded girdle shape, fewer facet cuts and high crown.